One of the most drastic changes since we started producing olive oil occurred at the olive mill or frantoio, where the traditional grinding stones and presses, unhygienic and labour-intensive at the best of times, gave way to modern centrifuges, a continuous system that is faster and more economical to run. I can remember waiting for hours in the past, often very late at night, waiting for the grinding and pressing processes to finish as the oil was already dripping to the bottom of the press where it was exposed to cigarette smoke and all sorts of unwelcome odours. Going to the frantoio is part of the ritual at harvest time. 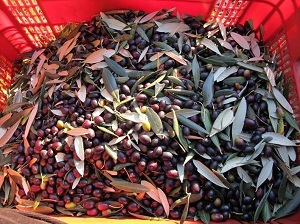 Each producer wants to be there, or at least be represented, when the olives are crushed and the oil comes out in a sensuous green-golden stream. This is partly to ensure that no olives or oil get mixed up, but also it is a time when information and experiences are shared and the oils compared. We are fortunate in that the frantoio we use is only a 20-minute drive away and offers a spectacular view across the Chianti landscape. It is small, modern and well-run, without the chaos that can make the whole process rather frustrating. 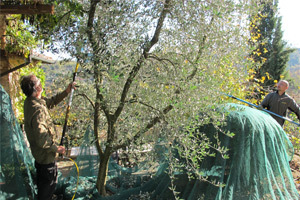 Upon arrival the olives are weighed and then washed as they go into the grinding chamber. From there the paste is pumped into long stainless steel containers in which there is a worm screw turning to keep the paste moving. Once the frantoiano or operator has decided that the paste has reached the desired level of viscosity, it is pumped into a two-metre-long centrifuge that separates liquid from solid matter. The liquid matter then moves into a smaller centrifuge that separates oil from other liquids. 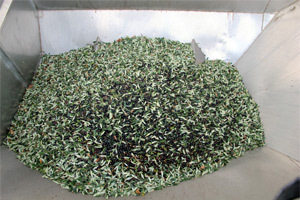 The oils is then passed through a filter to remove the last remaining minute fragments and to produce an oil that is both green and almost transparent. This practice helps to avoid the formation of sediment which could potentially harm the flavour of the oil and compromise its conservation over time.